PLEASE NOTE: THIS VERSION DESIGNED TO FIT E30 3-SERIES MODELS WITH M50/M52/S50/S52 MOTOR SWAPS. OIL DRAIN PLUG PORT IS IN THE CORRECT LOCATION FOR THESE ENGINES. 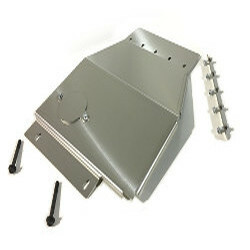 The UUC E30 MOTOR SWAP skid plate is available for all 1984-1992 E30 3-series models with updated E36 M50/M52/S50/S52 engines installed. Oil drain plug cover. No hole leaving the vulerable oil drain plug exposed. Retained by convenient wingnut style fasteners. Correct location for M5x-series oil pan drain plug, ovalized for better clearance.